I took this photograph while on a week long walk through the desert of the Western Sahara in Morocco. This vast landscape appeared to be virtually void of features which heightened my sense of the subtle changes in light and form. The week long walk was not always through beautiful sand dunes; often it was flat and gravely with the odd tree. After a day of walking with our small party of Moroccans and a French Canadian, I felt the chatter in my head slip away into a deep walking meditation. I was surprised at my power of observation in the following days and how tuned in I was to everything around me. The camels were just as much a part of our party with their different personalities as all of the human beings in our group. The walking meditation connected to me to the earth and he living creatures around me in a ways I have never felt before nor felt since. It is a challenge to translate this feeling in an photographic image but my intention was to created images that could echo the concept of my experience. At night, the camels were let go to run free to search out their own food and relax while we slept. 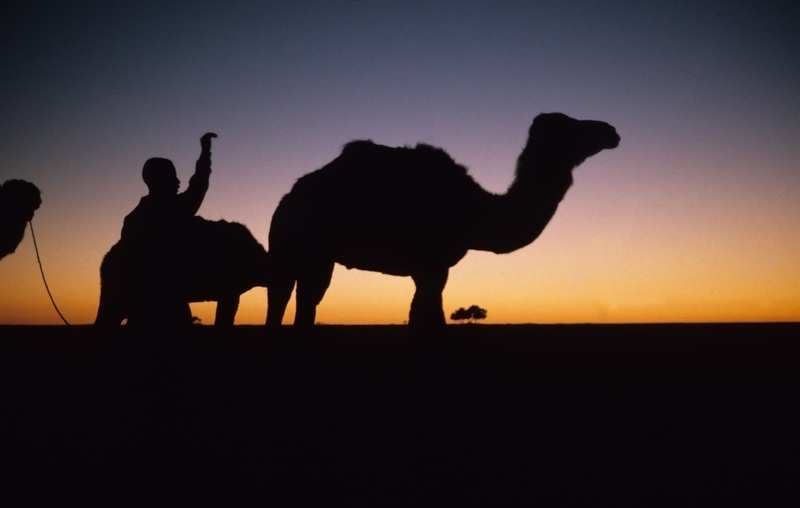 This photo was taken at the moment when the camel’s work day was over and they were released into the night. I chose to photograph this moment in the direction towards the sunset so that my friends would be silhouettes in front of the desert colors. Abdul’sl gesture tells the camels they are free for now. I was carrying my compact Leica M6 on this walk and this photo was shot with fuji positive film.